In 2006 I published an article in the Trademark Reporter proposing a theory for deciding, as between disputing parties, who owns a trademark. 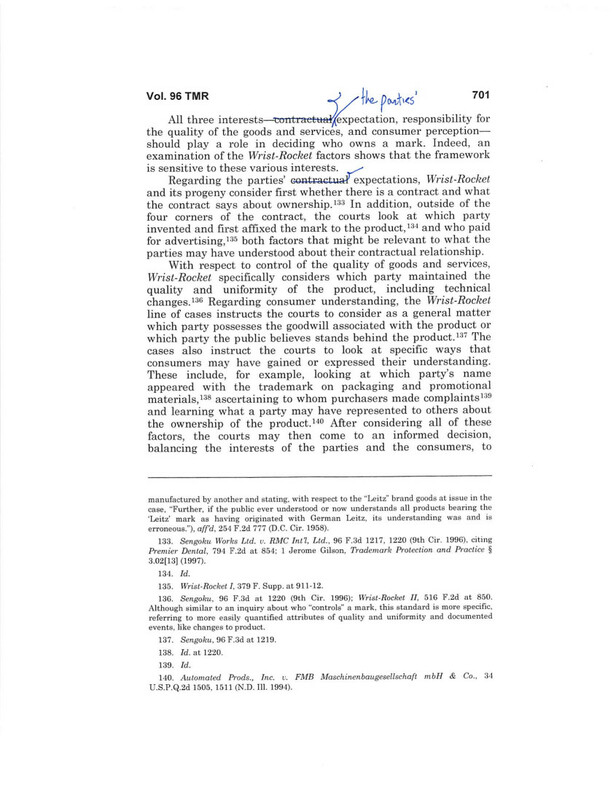 In the article I noted that courts struggled with a systematic approach to resolving an ownership dispute and, based largely on the existing case law that was commonly applied to manufacturer-distributor disputes, proposed a framework that would apply to all sorts of disputes, not just manufacturer-distributor ones. Even though these sources vary in their expression and enumeration of elements to consider, they have these main factors in common: “All three interests—contractual expectation, responsibility for the quality of the goods and services, and consumer perception should play a role in deciding who owns a mark.” P. Chestek, “Who Owns the Mark? A Single Framework for Resolving Trademark Ownership Disputes” 96 Trademark Reporter 681, 701 (May-June 2006). But the Board improved my theory. I had characterized one factor as “contractual expectation,” but the Board took it a step further—”the parties’ intentions or expectations (as objectively evidenced).” Correctly so, it is more than “contractual expectations”: the expectation can, and often will be, expressed through contract, but that’s not the only evidence that there might be of their expectations. In the case before the Board there wasn’t a contract, but there were admissions by the respondent—the party who ultimately didn’t own the mark—that she intended to create a specialty organization under the auspices of the American Veterinary Medical Association and had worked with others to accomplish that, although she left before the new organization was sanctioned by the AVMA. The petitioner was the entity she had worked to create. So while there was no contract, the clear intent of both parties was that the organization would own it.